14 Ways Landlords can Improve the Safety of Their Rental Units. Years ago, when my wife and I bought our first rental unit, we had no clue what we were doing, what we were getting into, and had to learn everything on our own. To make the rental units profitable, I had to learn how to fix things as they broke, rather than hiring a repairman to come fix the problems. We were also very concerned that we provide a safe and comfortable unit for the young college couples that would be our tenants. One of the questions we consistently asked ourselves was, “How can we improve the safety of our rental units for our tenants”? 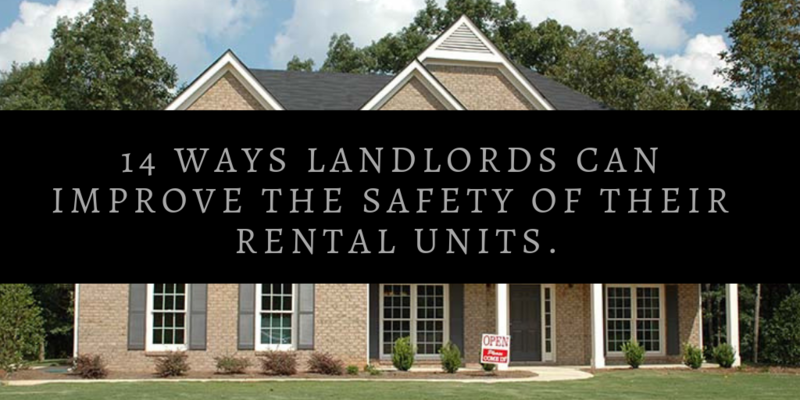 In this post, several items will be discussed that are important considerations for landlords seeking to protect their investments and the safety of their tenants. They are: fire extinguishers, smoke and carbon dioxide detectors, fire ladders, peep holes, bolt locks, emergency numbers, first aid kits, fire blankets, safety training, evacuation plan, window locks, good lease agreement, repairs done right, and knowing the local landlord/tenant laws. Ensuring that your rental unit has a fire extinguisher is an important, if not an essential, component of your safety plan. If a fire were to break out while the tenant is cooking, or an electrical fire were to start due to an electrical issue, you would want the tenant to have the ability to protect themselves and hopefully save your rental unit in the process. To ensure that the extinguisher gets used in such a circumstance, fire extinguishers should be mounted or placed in an easy to access area. Before running out to your local Home Depot to buy the first fire extinguisher you see, there are several factors to consider. For example, there are a variety of sizes and classifications of fire extinguishers. You need to pick the best fire extinguisher for the size and logistics of your rental unit. Those trained in fire safety can help in the decision making. Additionally, all fire extinguishers should be serviced regularly. Your local fire department may provide this service for free, or you may need to hire a trained professional who has received the proper training to perform the service. As a potential bonus, your insurance may provide a discount if you have a fire extinguisher on the property. Check out our line of Portable Fire Extinguishers HERE. Wheeled fire extinguishers are much larger extinguishers weighing 65-350 lbs and are designed for large commercial facilities as well as large apartment complexes. These wheeled fire extinguishers, despite their heavy weight, are engineered so they can be moved around efficiently, even by a single person. A 20 to 35-foot hose increases the fire extinguishers reach making it coinvent for stairs and working around other obstacles. Check out our line of Wheeled Fire Extinguishers HERE. Heat, smoke and carbon dioxide detectors are required by law to be in every bedroom of the rental unit. Additionally, some states require that smoke detectors be in halls, the kitchen and living room. Just like fire extinguishers, there are several different types of fire alarms. It is important that you place the fire alarm best suited for your rental units and according to existing local standards. Newer housing structures are required to have each fire alarm wired and connected on the same circuit so that if one alarm goes off, they all go off. This ensures that tenants will be alerted to a fire in the basement even if they are asleep upstairs. Check out our line of fire alarms HERE. Fire ladders are not required for rental units. However, supplying them for units that are more than a single level can allow tenants to quickly and safely escape from a burning building if the stairs are blocked by fire or debris. Some fire ladders can be permanently attached below the window frame, but most are rolled up metal ladders that you temporarily mount on the bottom of the window frame. By pulling the wrap cord, the ladder will then “unroll” towards the ground allowing the tenants to climb out the window and towards safety. Check out our line of fire ladders HERE. Fire blankets are made of a fire-resistant material and can serve multiple purposes. They can be used to wrap a person fleeing a fire to protect against the extreme heat, extinguish a small fire by smothering it, or used to extinguish a fire on a person’s clothing while also protecting the person applying the wrap. Having a readily accessible fire blanket can provide some options that otherwise would not be available. Check out our line of fire blankets HERE. First aid kits are not a requirement for rental units. Those landlords that provide this luxury certainly are providing a good will service towards your tenants and are concerned with their well-being. It might be more worthwhile to provide a bug out emergency bag in case of a natural disaster such as an earthquake or flooding so they can transport essential items as needed for such an incident. In multiplex rental units it is important to have an escape or evacuation plan available to all your tenants. Having it properly and prominently displayed for educational purposes may make the difference for survival. Nobody knows the home or apartment complex like you do, so by providing your tenants with a suggested fire safety plan and how to execute it could provide them with the needed seconds to get the whole family out alive. Depending on your area, you might want to contact your local planning and zoning department and request access to their evacuation plans for the city in case of a large scale natural disaster. It will contain the plans and designated assembly point for your area. In addition to the evacuation plan, it’s also a great idea to provide your tenants with a list of emergency phone numbers and addresses including the police, hospital, poison control, and fire department. Having the best fire extinguisher, sufficient smoke alarms, available fire blankets and other safety gear may be useless if they are not used properly. I suggest that landlords provide the essential safety and emergency equipment to protect their property and their tenants and provide the training on how to effectively use them. Making a short and simple video highlighting where the fire extinguishers, ladders, blankets and other safety items are and HOW to use them can be a fun and worthwhile effort towards the safety of your property and your tenants. Having a peephole in the front door is a safety feature that should be available to all tenants. The privacy of one’s dwelling and the ability to determine if the person on the other side of the door is to be allowed entrance is essential to one’s safety and security. If what is seen raises a red flag, the tenant then has the ability and time to activate emergency services that otherwise would not occur should an unwanted person gain entrance by your simply opening the door. It has also been shown to be a deterrent to theft as the intended thief may have cause to wonder if anyone is home or not. I have seen where landlords installed two peep holes, one for the adults and one for the kids. It’s a great safety feature for landlords to do. Every home should have a bolt lock on all external doors. Not only will this better protect your tenants at night when they are sleeping but also their property when they are away on vacation. I recommend that you trade out the standard screws that come with the bolt lock for larger 3-inch screws that will be harder for a potential thief to break open the door. Be sure to tell your tenants that you have done this so that they again feel that you are looking out for their best interest. Whenever I consider buying a rental unit, one of the first things I look for is the quality of the windows. The reason for this is because most of the energy (heat) is lost through poor quality windows. Additionally, I want to make sure that they are in good condition and have a safety lock on them to help prevent individuals from easily breaking in while the tenants are away. If the lock on the window doesn’t work, it should be replaced as soon as possible to protect your investment and your tenants. A little more peace of mind can help your tenants sleep a little easier at night. If your tenants insist on keeping the windows open at night on those hot summer days, I would suggest cutting a board or rod and placing it in the window slider so that the window can only open 4-7 inches, not enough for someone to crawl through and gain entry while tenants are sleeping. – Repairs: Who, how and when you or your designated handy man will enter the property to do repairs. Detail out how the process will work for when tenants are at home and how it will be handled if they are not home. A leaking pipe waits for no one and having a pre-arranged protocol for quick response will be needed to protect your property and the living ability of your tenants. – Damage done to the property: You’ll need to be prepared for this as property damage is one of the consequences of renting. Protect yourself by outlining the rules of the renting, for example, no smoking, repairs approved by management only, yard maintenance, etc., and ensure that each and every tenant has a copy of the agreed upon rules and has the opportunity to address any questions they may have related to those rules. – Rent due date and the eviction process: If not clearly outlined and agreed to in writing by the tenant, it may prove difficult to evict them when they are in violation. This could end up costing you a significant amount of money in repairs and possibly even legal fees. – Rental term limit: In my rental contract, I only perform rental contracts for 1 year. The reason for this is that in the past, renters who have stayed longer tend to get casual or careless and often cause more damage to the place. At the end of the contract we can choose to renew if desired. This also gives me another opportunity to inspect the inside of the unit or raise the rental fee if needed. – Inspections: You want to make your tenants feel at home and take pride in where they live, however, it is smart to include a clause in the lease agreement that you reserve the right to inspect the property X number of times a year, or through an agreed upon process agreeable to both parties to enter to inspect the property. You may not choose to use this clause, but it will be there if feel you need to perform an inspection. When drafting your lease agreement, consider hiring a professional who knows the laws for both tenants and the landlord. This is not the item where you want to cut corners to save some money as you might possibly end up “learning the hard way” what needs to go in the lease agreement. Tenants have the right to live in an inhabitable dwelling structure that is free of unacceptable living conditions. These include but are not limited to: leaking roof or pipes, backed up sewage, infestation of pests, poor structure, and faulty wiring. If you are skilled in some types of repairs, then you can use those skills to solve this problem. By doing so, you are the one responsible should the repair fail, or another problem is created. If you hire a professional and the repair fails, they are then liable to return and make right the repair and assume the financial cost to do so. If you do not know how to fix something, call a competent repairman to fix it. I like to watch their work, ask appropriate questions, learn all I can through the process, and hopefully be prepared to fix the same problem if it occurs again. Over the past several years, I have evolved in how I work with tenants, learning how to best meet their needs while protecting my investments and facilitating a cordial and working relationship with my tenants. It has been worth the effort to learn and grow with my business. Additionally, as the tenants have witnessed my diligence in trying to effectively make the whole landlord-tenant process work in a win-win format, the tenants have seemed to develop an appreciation for my efforts and have themselves worked for a more symbiotic relationship. I hope these thoughts and recommendations can be of benefit to you and your efforts to enhance your business, protect your investments, and appropriately serve those who choose your rental units to live and enjoy their lives. Success to you.